Electronics360: The global market for gesture sensing interfaces is set to grow 10% this year thanks to growth in emerging applications such as virtual reality games, smartwatches, smart TVs and other consumer electronics, according to IHS. Gesture sensing interfaces are poised to reach 1.8 billion units in 2015 and by 2019 IHS forecasts 2.5 billion gesture sensing interfaces will be shipped in consumer electronics and IT applications. “Gesture sensing control will not compete with touch screens, but will instead be complementary, because each technology is appropriate for specific applications,” says Calvin Hsieh, director for touch and user interfaces for IHS. Hsieh uses smart TVs as an example where touch screens will not work because the TV is too far from viewers. “Gesture sensing control is poised to become the second most common user interface for smart devices after touch screens.” He cautions, however, that it will take time to develop apps that rely on gesture sensing and change consumer’s touchscreen centric behaviors. 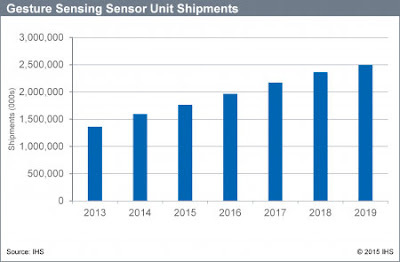 Among the leading gesture sensing technologies, optical-based 3D depth sensing—such as time of flight (ToF), stereo vision and structured light for freehand gesture control—will make up 66% of the sensor unit shipments for game console applications in 2015. 3D depth sensing technologies are also making an impact in webcam technology for notebook PCs, where it is forecast to grow 43% this year. This will push 3D depth sensing technologies to overtake 2D technology this year, IHS says.